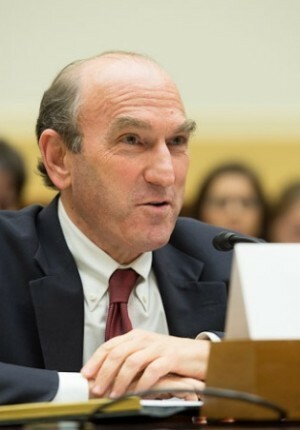 After last week’s horrific terrorist attacks in Paris, the Bush Institute asked Elliott Abrams to share his views on ISIS and the current nature of terrorism. Abrams is a member of the Bush Institute’s Human Freedom Advisory Council and a former Deputy Assistant to the President and Deputy National Security Advisor in the administration of President George W. Bush. Abrams now is a senior fellow for Middle Eastern studies at the Council on Foreign Relations in Washington, D.C.
Is what we see going on with ISIS primarily about religion or primarily about power? Or is it primarily about both? It is about both. You have a group, the Islamic State, that is using its religion to expand its power. It is trying to build a caliphate and win in a space where it can govern. The real distinction between ISIS and Al Qaeda is that the Islamic State is not just engaging in acts of terrorism. The Islamic State wants to rule territory and is doing so in parts of Iraq and Syria. You mentioned Al Qaeda. First, we had it. Now, we have ISIS. Are terrorism movements like these likely to keep splintering or spinning off into new forms? They will keep spinning off because they will respond to particular situations. There was no Islamic State when George W. Bush left the White House. Its growth is a reaction to the slaughter of Sunnis in Syria and the sectarianism of the Iraqi government, which Sunnis view as a Shia regime dominated by Iran. No one was defending the Sunnis, so the Islamic State used their fight to build themselves up. The Islamic State sees its mission as replicating the Prophet Mohammed by creating a caliphate. But ISIS is really responding to local events and building their following that way. They present themselves as rescuing Sunnis. Most Americans will want to know if this attack increases the odds of one here in the United States. What are your thoughts? Yes, I think it does increase the chances. A year ago, most experts believed that the Islamic State was interested only in fighting in Syria and Iraq. They didn’t want to fight a far-away enemy in the United States or Europe. Now, we know that is wrong. They just committed acts of terrorism with elaborate planning. They downed a plane that had just left Egypt and they attacked Paris. Logic suggests they will try it here. Looking ahead over the next four years, what leadership should the United States and its allies take to deal with such movements? American leadership is critical here. We have to defeat the Islamic State’s narrative or argument. ISIS is making the argument that it is rescuing Sunnis from slaughter, and replicating the life of the Prophet Mohammed by building a caliphate. It is using that argument to recruit followers in Syria and throughout the Muslim world. So there are two things we must do. First, Syria’s Assad regime has killed tens of thousands of Sunnis. Until that stops, the Islamic State will keep recruiting. Assad must go. Second, if people interested in joining their fight see the Islamic State start losing territory every week, we will start to defeat their argument. It will be obvious that they are not at all replicating the life of Mohammed. Others will not want to join them. We cannot be the only power fighting the Islamic State, but defeating their argument requires us to be the organizing power. Our efforts in Syria and Iraq have not been strong enough to do that.